word problems that involve more that one Simple Interest. word problems that involve Simple Interest with discounted loan. Interest Problems are word problems that use the formula for Simple Interest. There is also another type of interest word problems called Compound Interest Word Problems. 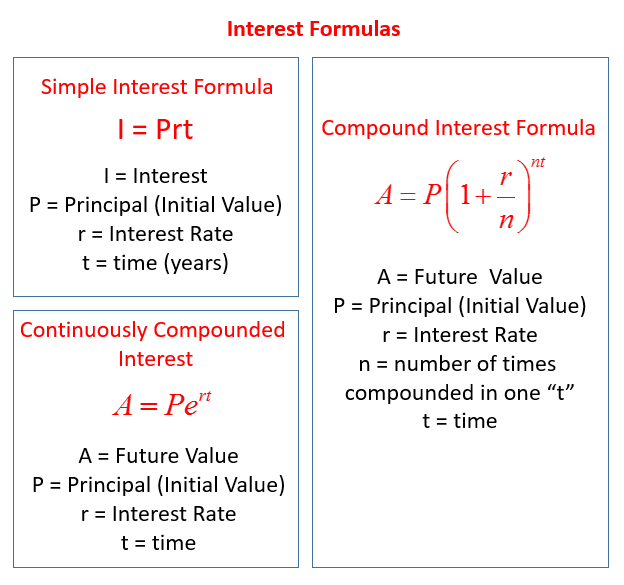 The following tables give the formulas for Simple Interest, Compound Interest, and Continuously Compounded Interest. Scroll down the page for examples and solutions on how to use the Simple Interest Formula. Interest represents a change of money. If you have a loan, the interest will increase the amount you owe based upon the interest rate charged by the bank. I is the interest generated. This type of word problem is not difficult. Just remember the formula and make sure you plug in the right values. The rate is usually given in percent, which you will need to change to a decimal value. John wants to have an interest income of $3,000 a year. How much must he invest for one year at 8%? Jane owes the bank some money at 4% per year. After half a year, she paid $45 as interest. How much money does she owe the bank? How to solve Simple Interest Word Problems (Investment Problems)? 1. Find the amount of interest earned by $8000 invested at 5% annual simple interest rate for 1 year. 2. To start a mobile dog-grooming service, a woman borrowed $2,500. If the loan was for two years and the amount of interest was $175, what simple interest rate was she charged? 3. A student borrowed some money from his father at 2% simple interest to buy a car. He paid his father $360 in interest after 3 years, how much did he borrow? 4. A couple invested $6,000 of his $20,000 lottery earning in bonds. How much do they have left to invest in stocks? 5. A college student wants to invest the $12,000 inheritance he received and use the annual interest earned to pay for his tuition cost of $945. The highest interest offered by a bank is 6% annual simple interest. At this rate, he cannot earn the needed $945, so he decides to invest some of the money in a riskier, but more profitable, investment offering a 9% return. How much should he invest in each rate? 6. A credit union loaned out $50,000, part at an annual rate of 6% and the rest at an annual rate of 12% . The collected combined interest was $3,600 that year. How much did the credit union loan out at each rate? How to solve interest problems using the simple interest formula? 1.If you invest $3,500 in a savings account that pays 4% in simple interest, how much interest will you earn after 3 years? What will the new balance be? 2. You borrow $6,000 from a loan shark. If you owe $7,200 in 18 months, what would be the simple interest rate? How to use the Simple Interest Formula to solve Word Problems? Jenna invests $13,000 into separate bank accounts, one earning 6% simple interest and the other earning 3% simple interest. If at the end of one year she earns $682.50 in interest, how much did she invest in each account? How to solve word problems with more than one Simple Interest? Example: Pam invested $5000. She earned 14% on part of her investment and 6% on the rest. If she earned a total of $396 in interest for the year, how much did she invest at each rate? Note that this problem requires a chart to organize the information. The chart is based on the interest formula, which states that the amount invested times the rate of interest = interest earned. The chart is then used to set up the equation. How to solve word problems with two simple interest rates? Johnny is a shrewd eight-year-old. For Christmas, his grandparents gave him ten thousand dollars. Johnny decides to invest some of the money in a savings account that pays two percent per annum and the rest in a stock fund that pays ten percent per annum. Johnny wants his investments to yield seven percent per annum. How much should he put in each account? How to solve a real life problem involving interest? Suppose $7,000 is divided into two bank accounts. One account pays 10% simple interest per year and the other pays 5%. After three years there is a total of $1451.25 in interest between the two accounts. How much was invested into each account (rounded to the nearest cent)? A discounted loan is a loan that collects interest from the amount of the loan or face value of the loan when the loan is made. The interest is deducted from the loan amount so you don't receive the full loan amount or face value of the loan when you receive the loan. The deducted interest is the discount. Problem: You borrow $2,000 on a 12% discount loan for 12 months. 1. What is the loan discount? 2. Determine the net amount of money that you will actually receive. 3. What is the loan's actual annual simple interest rate?